In case you don’t already know, the recent events in Libya and Egypt are not isolated incidents without any relevance or significance. They are part of a much larger problem that is more than an annoyance and inconvenience. It is a threat to the planet unlike any seen since the days of Adolph Hitler. There are evil forces in play and in many parts of the world they are wreaking havoc with the intention of extending their power and reach to all corners of the globe. So far I’ve said nothing new or enlightening to anyone who has been paying attention to world events. What I will do now is show some basic similarities and differences between the evil forces within radical Islam and the ruling Nazi party of Adolph Hitler. The first similarity that strikes me is the tactic of blame and retaliation. In and of itself there might be some justification for a group to react harshly to mistreatment or discrimination. However in the case of Nazi Germany and today’s radical Muslims, there is no importance in the mistreatment or discrimination being real or verifiable. The response is not there for purposes of self-preservation. The response is a tactic designed to provide an excuse for violence. Violence which is there to damage the morale of those they want to conquer and scare those who would fight against them. It’s a clever tactic, because despite the fact that it is immoral to the point of it being evil, it works. To illustrate this point I will give you an excerpt from the book that speaks of a time when the tactic was used by the Nazis in Amsterdam to damage the resolve of the Jewish populace and those Dutch who passionately fought for what was right. The entire chain of events that resulted in the raid and deportation of these Jewish men, including Sipora’s cousin David, appeared to be a setup from the start. Soon after the Jewish Council was formed, an NSBer was shot in what was said to be an altercation with some militants fighting back against the Nazi occupation. In retaliation for his murder, Nazi officials rounded up between 300 and 500 Jewish men and deported them to the concentration camp of Mauthausen. Although the number of people picked up was relatively small, it was essentially the first stage in the systematic destruction of nearly all of Holland’s Jewish population. The outrage of the local Dutch citizenship was severe; a labor strike was organized by local labor union leaders. This resulted in thousands staying away from work and marching in protest against what they considered to be unlawful and unjust treatment of their fellow Dutchmen. Although the strike would be remembered as courageous and decent, it had no impact on the Nazi occupiers other than to create anger against the elements showing support for the Jews of Amsterdam. The Nazi response was to execute the organizers of the strike; soon after, they outlawed any other political party other than the NSB. Whether or not a movie criticizing Islam really created anger in these countries or not, the true reason for the murder of J. Christopher Stevens, the U.S. 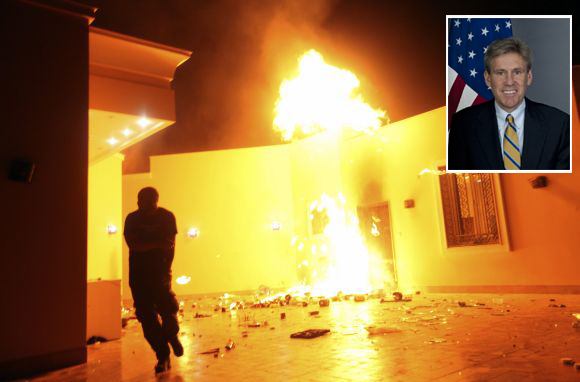 Ambassador to Libya, and the rioting outside the U.S. embassies in Libya and Egypt was the incitement coming from within. The powers that be, powers that want world dominance, are not only not pushing for tolerant non-violent reactions, on the contrary, the more violent their people get, the more successful they are becoming. I know Egyptian Muslims here in the United States who are decent, hardworking people who live and contribute to American society. The people have the same ability to be civilized and decent as anyone we know. But put people in an environment powered by hate, hate of Americans and anyone Jewish, and they tend to at best not fight the violence, at worst be part of it. It is human nature to get swept up in the fervor regardless of the consequences to themselves or others. In 1945 I am sure many people thought Germans were inherently evil. By now we know this is far from the case, but so many got swept up in what they perceived as the excitement Hitler was bringing to their lives that they were willing to be part of mass murder on staggering levels. An important distinction between Nazi Germany and the elements of tyranny in the Islam world is that Germany was one country that was easily targeted. Today the enemy lives in many countries and is spread out in so many areas that pounding them to submission like the allies did to Nazi Germany may not be a viable option. We should learn from this that any one of many strategies may be the right one in combatting this evil, and the best thing we can do is to support our leadership even when we do not agree with the strategy, and even when we do not like our leadership. It’s important not to lose sight of who the true enemy is. So who is the true enemy? Is it every Muslim on the planet? Is it every Muslim country’s government? What we are seeing happening today is not about religion. Like any other time in history when a group tried to conquer the world, this is about a group tyrants, dictators, and totalitarian regimes, not about the masses. However the masses are responsible for their actions, whether they commit those actions or live within the community that commits those actions. The people living within these countries need to start understanding that it all falls on them. Unless the decent people within those masses stand up, and I truly believe that is still the majority, the ultimate outcome will be their demise. For those who say they don’t care, understand that I jumped ahead. When evil is conquered it is after it caused a tremendous level of devastation, one which in this case would be focused on the murder of Americans and Jews. This entry was posted on Thursday, September 13th, 2012 at 3:37 am	and posted in Uncategorized. You can follow any responses to this entry through the RSS 2.0 feed.